Hi, you can call me Yasuo. I immersed myself in local life by changing my career to focus on the local people. 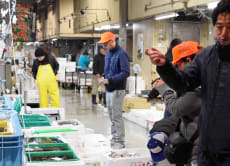 I sell fish in a car and I want foreigners to see and feel the atmosphere of local life in Japan. I have been working for 8 years and this made me competitive enough to work with others. I have a network of people inside the market that can help accommodate guests. I am good at distinguishing good fish. I have done a few workshops on how to prepare sashimi and I am good at it. I can make sashimi fast.